PCRI’s Homeownership Retention Program invites you to come learn about components of comprehensive Estate Planning such as wills, trusts, advance directives, power of attorney, how to protect your assets, and more! PCRI’s Homeownership Education and Counseling program assists low- to moderate-income, first-time buyers in creating a successful homeownership action plan. One-on-one counseling is designed to help overcome obstacles that would prevent affordable mortgage financing. We analyze financial and credit situations, identify barriers and develop a plan to remove these barriers. Join us Saturday, December 2, 2017, at the Portland Metropolitan Workforce Training Center (located at 5600 NE 42nd Ave.) from 10am-1pm. Topic presentations range from financial education to getting mortgage ready. Continental breakfast will be provided. 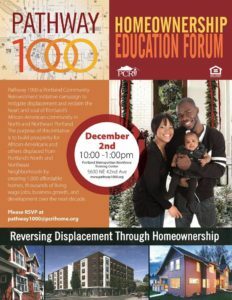 To RSVP, please contact Marqueesha Merriweather at marqueesha@pcrihome.org. 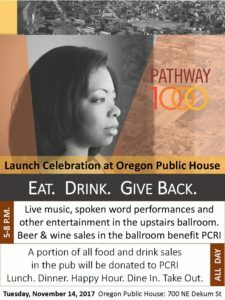 Portland Community Reinvestment Initiatives, Inc. (PCRI) is hosting a fundraiser at the Oregon Public House on November 14th, 2017. A portion of the food and drinks during the day will go towards our Pathway 1000 initiative. During happy hour (5pm-8pm), there will be beer, food, live performances, spoken word and more! Please come out and support our initiative!